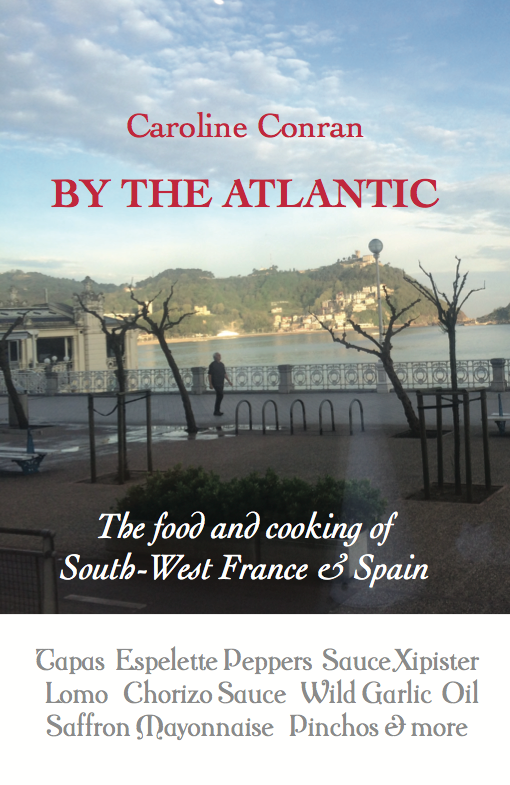 The food & cooking of South West France & Spain • This book is about the food and cooking of South West France • • It includes some aspects of Spanish Basque cooking • • Good, fresh, seasonal local ingredients typify the South West, with its warm, temperate, sunny-but-showery Atlantic climate • This book is about the cooking and the lifestyle in both the French and Spanish Basque regions, since, sharing their own language, the two countries are really one nation. The small towns are unlike any other, with restaurant names that sound explosive, Berasategui, Arbalaitz, Arzak, and Atxa. Basque food is all the rage, and pintxos, using elvers (small eels), fish, garlic mayonnaise and chorizo, are very popular. One wanders from eatery to eatery, sampling specialities rather than opting for a full meal. The region and food need an accomplished cook and food historian to explain; this Caroline Conran has done. Caroline Conran, food writer, is former Chairman of the Guild of Food Writers and was a Trustee of the Oxford Symposium on Food and Cookery. After leaving Cambridge Art School she worked for House and Garden and subsequently worked as Home Editor on Queen magazine for several years, editing the food columns. In 1963 she married designer and restaurateur Terence Conran, with whom she had three children. The marriage lasted 30 years. She helped to found his pioneering Habitat shops in 1964, setting up the kitchen department and working as a buyer, travelling extensively in India. She went on to pioneer the Food and Wine sections of the Sunday Times magazine, the first of any newspaper to offer this section, now one of the main components of all the colour supplements, acting as Food Editor for the Sunday Times for 13 years. She was also food editor of Nova magazine. At the Sunday Times she started, with Michael Bateman, the very successful Real Bread Campaign and introduced, amongst other things, the Sunday Times series on Self-Sufficiency, telling people how to make their own kippers, wine, bread, cheese, yoghurt and muesli. She and Bateman introduced to the UK, the Nouvelle Cuisine of the three star French chefs – inspiration to Marco Pierre White and many other British chefs. She became friends with Michel Guérard, translating and editing his Cuisine Minceur and Cuisine Gourmande, and later the work of the Troisgros Frères, Alain Chapel, Roger Vergé, Jacques Maximin and others. She is the author of Poor Cook, written with Susan Campbell. She is also the author of the highly acclaimed Conran Cookbook, done in collaboration with Terence Conran, which has sold well over 100,000 copies (published 1980 by Mitchell Beazley and last republished in 1997 by Conran Octopus). Her first book on the South of France, Under the Sun, which was published by Pavilion in 2003 is about the Food of Southern France. It sold in excess of 30,000 copies. Her last book, Sud de France, The Food and Cooking of Languedoc, published by Prospect Books in 2013, won the André Simon Award for the best cookbook 2013 and the Fortnum and Mason Award for the best cook book the same year. 'Caroline Conran looks at food nearer home. It's not a big glossy number, but rather a thoroughly researched, fascinating, appetite-inducing book that I shall cook from for years (certainly the poulet chilindron and the goat's cheese, green pepper and chorizo cakes, to name but two recipes). When all's said and done, what I really want from a cookbook is great recipes in a cultural context. That's what Conran gives. By The Atlantic (Prospect Books £17.99), the latest gem from Caroline Conran. 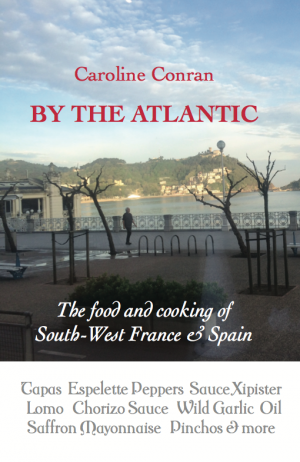 Here, she gets stuck into the food of south west France and Basque country. A fine work, scented with wood smoke, paprika, goose fat and pig. In this successor to her multiple prize-winning Sud de France, Conran heads west for a succulent tour of South-West France and Spain. Her recipes range from the familiar, such as Warm Octopus Galicia Style (‘one of the best ways to eat octopus. If the potatoes are waxy, firm and freshly cooked, the flavours together become magically enhanced’), to the recondite. Basquaise Tripe is a casserole with tripe, trotters and wine that is thickened with eggs. But memorable dishes of the region do not have to be unremittingly carnivorous. Basque Gaspacho has ‘a real punch to it and is utterly refreshing’. Pondering black rice, customarily eaten with squid, clams, mussels and miniature cuttlefish, she exclaims, ‘There can hardly be a more striking dish than a glistening plate of black rice with a fat piece of lobster on top.’ Little courgette flans ‘often appear with roasted meat’, while a sauce of chorizo, tomatoes and paprika ‘brings a characteristic glow to any fish’. Keen and knowledgeable, Conran’s book is a hugely knowledgeable guide to the region that has produced three of the world’s top 10 restaurants.